Cyrus Mistry, former chairman of Tata Sons has sent in a statement after the recent 2017 annual report of Tata Motors. The report was signed by N Chandrasekaran, the current chairman. Mistry says that he found certain "references to refutation of observations about specific facts." Mistry sets the record straight by saying the following. "I have in my various communications highlighted areas of concern and potential conflict. These are all backed by documents as presented in my representations. I had highlighted the practice of lending without adequate risk assessment, particularly in the Nano and Small Commercial Vehicle segment. This caused a huge NPA loss in both Tata Motors and Tata Motor Finance, to the tune of nearly Rs. 4000 crore. If we are to benchmark the gross NPA percentage as against any other finance company in the similar segment the difference would be in multiples. This easy finance, artificially bolstered the market share figures and as soon as this was reigned in, we saw a steep drop in the volumes of Small Commercial Vehicles (SCV) and the Nano. In case of SCVs', volumes fell by more than 50%. This clearly has been biggest reason for the market share loss but not the only one as there were many factors including, inadequate investments in the CV product pipeline etc. Continuing to impact even the first quarter of this year where we have seen significantly weaker volumes of Medium & Heavy Commercial Vehicles (M&HCV). Year on Year drop in this segment is 35% which is a higher drop than a close competitor. This indicates a further drop in market share in the M&HCV segment, which is the main source of revenue for the Indian operations. As regards the Nano. The project as conceived was indeed brave. For a number of reasons, the car was not profitable many years. During my time as chairman of Tata Motors we tried to make significant products improvements based on market feedback such as an openable tailgate, power steering and an AMT version. All these initiatives did not bare fruit. It was only then that an unanimous decision was taken to discontinue the Nano Production. It has been almost one year since then. In my representations, I had drawn attention to potential areas of conflict of interest in the supply of Nano body shells to Jayem motors where Mr. Ratan Tata has made investmentsin his personal capacity, thus forcing the Nano production to continue on a subscale basis for almost one year after the original decision had been taken. As I understand the Nano today, continues to incur heavy losses. At the very least this continuous loss for nearly a year has depressed the share value by thousands of crores on the present PE multiple. I am also surprised to see complete silence from the board when it comes to the issue of sharing confidential detailed cost information about the Nano Cars to Mr. R. Venkatraman who used to be on RNT associates and conflicted, which is substantiated by the e-mail trails in my submissions and available to the board. Recently Tata Motors has raised large amount of capital from the shareholders, the company has not been able to pay dividends to its shareholders and is undergoing a huge retrenchment of its loyal employees, is wholly irresponsible of the board not to take action so as to stem losses as soon as possible. I raise these issues with a view to ensure such decisions in the future are taken with due regard to the consequences on all stakeholder I think it is the New Chairman Mr. N. Chandrasekaran and the board that should exercise proper care while making statements to ensure that they are responsible." 1. All fall in CV and PV market shares happened in five years when CPM was at the helm. 2. The chairman's letter clearly states operational weaknesses in the company again, when CPM was at the helm. 3. The Tata Nano constitutes a very small part of TaMo - out of the Rs 2,80,000 crore revenue, only about Rs 9000 crore is from the PV, and of that, the Nano is a very small amount. 4. It was Ratan Tata himself who had brought it to the attention of the Tata Sons board on his personal investment with Jayem and that there has been no commercial arrangement whatsoever between Tata Motors and Jayem in this regard. Also, no confidential information has ever been shared with anyone. The Ratan Tata and Cyrus Mistry saga has been going on for quite some time. Allegations have been levied by both the parties concerned wherein Tata Sons had said that Mistry was creating a parallel power structure. Many of the contracts undertaken by the Shapoorji Paloonji and company were in fact by Cyrus' family. In his defence, Cyrus says that the Nano project was a complete debacle and it was because of Tata's personal interest that the production was still on. A unanimous decision was taken to end production sometime last year however, it hasn't happened so far. While its still unclear about who is at fault here, one thing is glaringly obvious. The Nano project hasn't really taken off and from what was estimated to be a people's car is nowhere to be seen on the road now. The image attached with the Nano as a "cheap car" and the subsequent quality issues lead people to stay away from the vehicle. 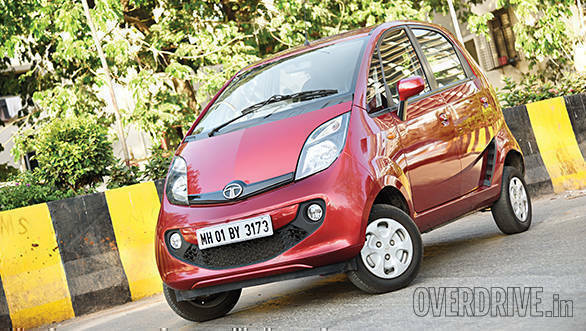 While Tata Motors did regularly update the car, it still lacked the trust factor from the buying populace who still were happy to pay a small premium for established products like the Maruti Alto. Currently the Nano supply to dealerships is coming at a slow pace and several dealers we spoke to said that they aren't ordering for fresh stock either. It looks like only a matter of time before Tata Motors officially drops the axe on the Nano production.